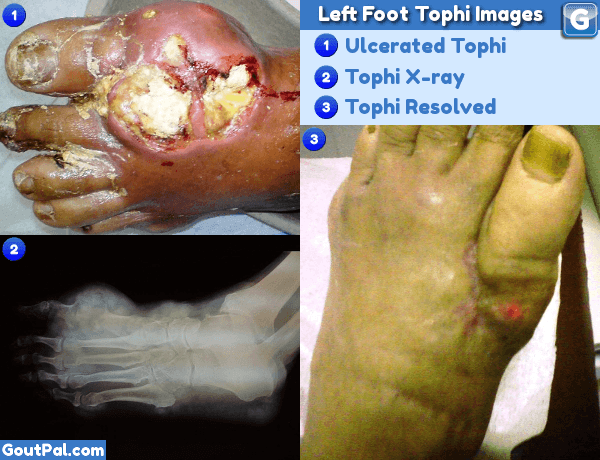 These photographs of the left foot show tophi before and after treatment, as part of my Feet Tophi series. This is a particularly bad case report of a 75-year-old Caucasian man. As well as this large ulcerated tophi lump on his left foot, the patient had right foot tophi and left thumb tophi. It is not clear from the case study why he left his gout untreated so long. The report speaks of the patient intentionally stopping allopurinol treatment 4 months earlier. However, tophi of this magnitude take far longer than 4 months to develop. It suggests that allopurinol treatment was below acceptable dosage. This is a common problem. Because it causes non-compliance as patients lose confidence in the medication. Though my gout never got this bad, I had to argue the facts with doctors before getting sufficient allopurinol to achieve safe uric acid levels. Be warned! Because you might have to take control of your treatment. Then insist on appropriate uric acid lowering treatment to bring uric acid down to 5mg/dL or below. In this gout study, the patient attended Emergency Department after a tophus on his left foot became painful for 5 days, then eventually burst. As well as the other tophi mentioned earlier, the patient had completely lost mobility of the first joint of his left foot. X-rays revealed total destruction of the first joint, and amputation of the whole left foot was considered. Fortunately, surgeons attempted removal of damaged tissue, and thorough clean of the affected area first. After 6 weeks, all ulcers healed completely, and the patient remained symptom-free six months later, except that mobility in the big toe never recovered. Tophi are typically found on the helix of the ears, on fingers, toes, wrists, and knees, on the olecranon bursae [elbow], on the Achilles tendons and also rarely on the sclerae, subconjunctivally, and on the cardiac valves [eyes and heart]. They can cause pain and dysfunction and are rarely associated with ulcerations, bone fractures, tendon and ligament rupture, carpal tunnel and other nerve compression syndromes. Next, you can see other parts of the body that are affected by gouty tophi in the tophi guidelines. Leave Left Foot Tophi to browse the Tophi guidelines. Multiarticular chronic tophaceous gout with severe and multiple ulcerations: a case report. Falidas E, Rallis E, Bournia VK, Mathioulakis S, Pavlakis E, Villias C.
J Med Case Rep. 2011 Aug 19;5:397. doi: 10.1186/1752-1947-5-397.